Export as Quadrangular polygons. The Quad Poly and Tri Poly buttons determine whether polygons in this 3D object will be 4-sided (preferred within ZBrush) or 3-sided (triangles) when exported. These are only pressed one at a time. The Texture button determines whether this object’s accompanying texture will be exported alongside its geometry (using UV coordinates). If turned off UV coordinates will not be included in the file. The Flip Face button determines whether the object’s polygons will be flipped when exporting. This may be necessary when importing into certain 3D modeling programs. The Merge button helps optimize meshes when importing and exporting 3D objects. It is enabled only when OBJ format is selected, and removes duplicate (overlapping) polygons. This option may cause the exported model to render incorrectly when imported into certain other programs. The Export Groups button, enabled only when OBJ format is selected, determines whether areas in the mesh will be exported as separate items with group assignments (if pressed), or the mesh will be exported as a single group (if un-pressed). 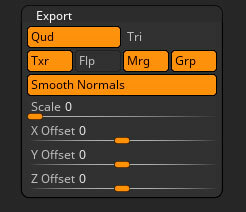 The Smooth Normals option will include smoothed normals in the exported file when the OBJ format is used. The Scale slider determines the size of the exported object. 1 equals 100% size. The X Offset slider will set the X coordinates of selected tool upon export. The Y Offset slider will set the Y coordinates of selected tool upon export. The Z Offset slider will set the Z coordinates of selected tool upon export.